A replica of the Clock Tower in Homs, which became the city’s most famous gathering point during anti-regime demonstrations in 2011. 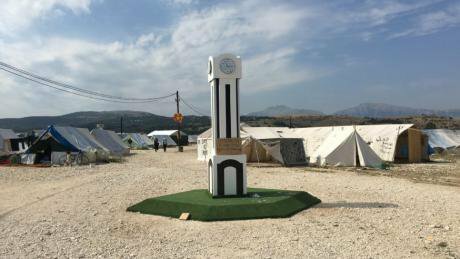 It was built by the Syrian residents of the Katsikas refugee camp, in Greece’s Epirus region. 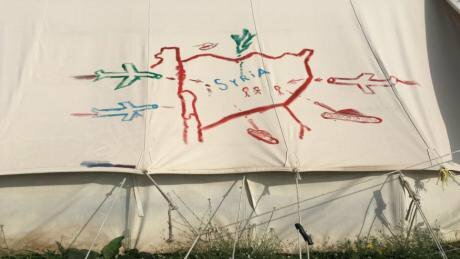 The clock is set to the time they entered the camp and a caption underneath it reads: “Time stopped when we came here” – September 2016 (Andres Barkil-Oteo/SyriaUntold)[This article is the outcome of a partnership between SyriaUntold and openDemocracy]. Five years in, with almost 5 million refugees outside Syria, 6.5 million internally displaced, and 450,000 deaths, the Syrian war is a humanitarian disaster of extraordinary proportions. In this current grim reality, why think about mental health services? Is it advisable to treat the severely ill first (the clinical approach), or to prioritize the strengthening of community ties (the population health approach)? In this essay a model based on opposition-linked self-organizing councils will be discussed as potential primary partner in fortifying mental health resiliency in the affected communities. When planning mental health services, treating PTSD is what usually comes to mind; i.e., clinical approaches to clinical problems. However, this is a very narrow and limited vision, that many times leads to the over-pathologizing of social suffering. To counter these problems and to embrace a more holistic approach to the mental health issues of societies, the World Health Organization (WHO) sponsored the Inter-Agency Standing Committee (IASC) Guidelines for Mental Health and Psychosocial Support in Emergency Settings. These guidelines revolutionize the way we look at mental health services, expanding them to include psychosocial issues like providing safe shelter, food, and connections with family members, and broad community support. Examples of what constitutes basic services and security include the establishment of security, adequate governance, and the provision of services addressing basic physical needs. A mental health position on these issues is to advocate that these services be put in place and delivered in a way that maintains dignity and promotes mental health wellbeing. The issue of family and community support are second in importance, immediately following the attainment of basic needs. It is widely recognized that, in a situation of war, family and community networks are disrupted, so it is beneficial to restore them through initiatives like communication improvement efforts, family tracing and reunification, and assistance in mourning and communal ceremonies. Who is going to deliver these services? Usually this framework is implemented by local and international NGOs in post-disaster settings. However, in the current Syrian context, this can be very challenging. In addition, given that we are looking at a protracted conflict that could last for years, it is preferable to look for sustainable solutions. Finally, whatever solutions are proposed, it is important to suggest models that have been implemented previously, and which are not something foreign to the societal context. In the last few years, many examples of self-governance “councils” spontaneously emerged in many opposition-held cities in Syria. These emerged when communities became free of the state and its services, as well as its overbearing impositions. These social orders were created not by a top-down government mandate but through voluntary cooperation, and creative innovation. These came into existence mainly as a practical and non-ideological solution to immediate problems they were encountering, including living under missiles and barrel bombs, and unreliable or non-existing sources of potable water, fuel and electricity. The way these councils developed — through democratic elections, finding consensus with armed forces, or with representation based on families or local power circles — depended on the location and local actors. These social orders were created not by a top-down government mandate but through voluntary cooperation, and creative innovation. The late Omar Aziz, a Damascene intellectual and political activist, was one of the first people to write about local council models that aim to help people to “manage their own lives independent of institutions and state agencies, and to create a space for collective expression that supports the collaboration of individuals”. Aziz stood for a complete break with the existing state, the achievement of collective liberation without waiting for regime change, or for one ruling power to replace another. He believed that communities are capable of producing their own freedoms regardless of political vicissitudes. Some of the essential roles of the councils include helping people secure shelter, food and safe space; assisting families to connect with their loved ones; providing emotional and legal support for detainees and their families, along with information about their situation; and coordinating medical services, media coverage, and educational initiatives. What is the relation between the local councils and the future of the population’s mental health? For years, generations have become habituated to what in psychology is known as “learned helplessness”. Learned helplessness is the total acceptance of a given condition: when someone is repeatedly exposed to shocks, with no ability to resist or escape, they become docile and accepting. Should an exit from the shocks subsequently be provided, the opportunity to escape will not be taken. Agency is a dangerous thing, and authoritarian regimes, to rule and survive, depend on the erosion of agency, and the inculcation of learned helplessness. If there is no way out, then the best response is to adapt to the system. People in this mentality lose the desire to grow and prosper, and they concentrate on preventing things from becoming worse (especially when they don’t believe they can improve their situation). Fear of the system, and dependence on the system, creates a toxic mixture that slowly erodes agency. One cure for learned helplessness is to foster “agency.” Agency is the capacity, condition, or state of acting or exerting power. An act of agency is one that has an outcome that the individual has, in whole or part, foreseen. In the psychological literature, agency is comprised of three steps: foresight, choice and self-initiated action. “Foresight” refers to the planning phase of engaging in a novel activity, before the initiation of the act itself. The experience of choice is the selection of a specific behavior by an individual. When one is coerced to do something, the set of brain mechanisms engaged is entirely different from those activated when someone choses the same behavior. Thus, learned helplessness eliminates the experience of choice. Self-initiated action is an action carried out through one’s own effort. In the case of learned helplessness described above, if the shocks were stopped without any input on the part of the victims, the latter would not experience agency, because they had not played any part in the cessation. While the victim experiences relief, the learned helplessness remains. Thus, even doing good things for people may not be the best way to improve their functioning; agency and empowerment only come because of effort by individuals. A widely-held maxim in psychology is that having a sense of control over events is one of the main sources of feeling safe. One of the primary traumatic symptoms in those suffering with PTSD is a sense of helplessness, a lack of the basic senses of trust, predictability and safety. The concept of self-efficacy, or personal agency, is found whenever individuals believe that their actions will likely lead to positive outcomes. This concept can be expanded to collective efficacy, which denotes the condition of groups that believe that they are likely to produce good outcomes. Evidence shows that people who have experienced trauma are at risk of losing their sense of competency, and the skills required to deal with problems they encounter, so successful interventions seek to empower social groups to overcome hardships. Since it is somewhat unrealistic in war-like environments to expect individuals to create this sense of competency on their own, communities need to come together to solve collectively the problems that affect them. The WHO recognizes the capacity of self-efficacy as essential for recovery, so it emphasizes the promotion of self-sufficiency and self-government among war-affected populations. Activities that are conceptualized and implemented by the community itself may contribute to a sense of communal efficacy. Among the major mental health interventions following the tsunami in Asia, for example, were community efforts to support the rebuilding of fishing boats, allowing fishermen to resume their livelihoods. Similarly, for children and adolescents, the restoration of the school community is recognized by the WHO and the United Nations Children’s Fund (UNICEF) as an essential step in reestablishing a sense of self-efficacy among children. In the absence of local public health systems, supporting a form of self-governing councils could be the building block for providing a population mental health approach. This could be especially important in the case of internally displaced or refugees who were uprooted from their cities, and away from their local formal and informal systems of governance. Research showed that people’s recovery from the psychological effect of political violence is highly dependent on individuals’ perceptions of community resilience. The bond between individuals and their communities promote agency and resilience through friendships, shared meaning of their suffering and collective vision for their future. In summary, there is strong evidence from studies done in other countries with mass exposure to trauma and protracted conflict, that community based programs do have positive impact on increasing people’s resilience and promoting adaptive coping strategies. Empowering communities’ sense of agency and control increases their collective efficacy and their social capital. These are the building blocks for community recovery after mass trauma events in protracted conflict settings. This approach tends to be largely ignored in favor of a focus on individual clinical cases; but to heal the individual, we need to help the community to heal itself, escape from learned helplessness, and foster agency and action. This will then serve as a foundation to build clinical programs that deals with individual clinical problems, and not the other way around.